In this review, we’ll be covering CinnaBomb E-Liquid. This e-juice is only available in a large 100ml bottle, and it does come in a dark colored Chubby Gorilla Bottle, which makes dripping with this e-juice a breeze! In addition, with these types of bottles, it’s much easier to carry around with you and won’t break if you drop them unlike large glass bottles! The only nicotine strength currently available is 3mg, which is perfect for dripping or sub ohm tanks! At only $12.99 on sale for a 100ml bottle, this is a great deal! Before getting any further, I would like to thank EJuice Connect for sending this e-juice my way for the purposes of this review! I will give you my overall thoughts about this flavor and let you know whether or not I recommend it! Remember, taste is subjective, so what I may like you may dislike and what you like I may dislike. I will first go over the specific mods and atomizers used to test each of these flavors and then will continue on to the CinnaBomb E-Liquid review! Click Here to Check Out CinnaBomb E-Liquid! Flavor Description: CinnaBomb e-liquid tastes just like your favorite big cinnamon bun from the mall, The taste we All LOVE! Check out the video below for an in-depth look at this awesome e-juice! There are tons of e-liquids on the market that try to capture this type of flavor profile, and while some are great, some are not. In some e-juices that have cinnamon as a primary flavor, the cinnamon comes off too strong and can just be overwhelming. 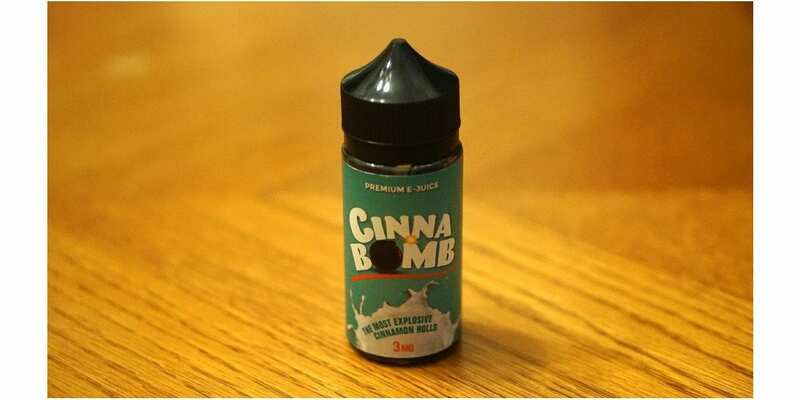 However, this is certainly not the case for CinnaBomb E-Liquid! This was something I was afraid of right away upon receiving this e-juice, but I’m happy the cinnamon flavor in this e-juice is done right. On the inhale, you get a nice creamy cinnamon flavor. On the exhale is where this flavor shines, you get the same creamy cinnamon flavor, but is then followed by bakery notes and there is a sweetness that you taste throughout the entire exhale. That sweetness is perfect for that glaze flavor they’re going for. This e-juice certainly captures the flavor description, which is a huge pro! Like mentioned previously, the cinnamon flavor is not too strong, but it is the main flavor that I do taste, so if you dislike cinnamon flavored e-liquid, then you probably wouldn’t like this one. All in all, CinnaBomb E-Liquid certainly tastes exactly what it was going for, and it is quite tasty! The throat hit is silky smooth, and the vapor production is what you’d expect from an 80VG/20PG blend. If you’re a fan of cinnamon flavored e-juice or looking for a solid Cinnamon bun flavor, then I can easily recommend this e-juice, especially for only $12.99 on sale for a 100ml bottle! I hope this CinnaBomb e-liquid review helps you find your next all day vape! Feel free to leave any questions or comments below! Thanks for reading!